Free home delivery of local, organic food. Founded in 2007 (why am I just now discovering them? ), Organics At Your Door is the first organic & local food delivery service in Ohio! Delivering for FREE to the following counties: Cuyahoga, Lorain, Medina, Wayne & Summit. This company/farm has partnered with numerous other small organic farms all over Ohio to provide organic produce, meats, dairy, bakery, honey and syrup. The main business is via CSA, with a variety of options (sadly nothing vegan/vegetarian) that best fit your needs. A weekly box is available for those with commitment issues, as well as a 20lb Juice Bag perfect for daily juicing. Additional chicken, beef and honey can be purchased a la carte. Deliveries are available every Saturday & Sunday. 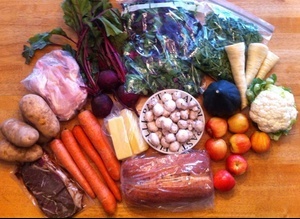 Check out what to expect in a weekly CSA share. are they still in business? i've been looking for something like this but the link doesn't work. We use Blue Sky were I work - AWESOME!!! I love Blue Sky, but they only deliver for a minimum of 20 people and a $200 order total. Perfect if you're in Cleveland and can get a group of people together!